 As one of the top travel destinations in New Hampshire, the western White Mountains certainly has its fair share of hotels, condos, and campgrounds. But, did you know it is also home to some non-traditional unique lodgings that you won’t find anywhere else? Make your lodging your next destination on your next visit to the mountains! All aboard! The Lil’ Red Caboose in Lincoln is truly one-of-a-kind. 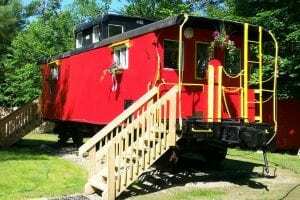 Built in 1922, the old caboose was rescued by Randy and O.J. who have lovingly completed the renovation from its former owner. Moved by a crane from the Hobo Railroad, the Lil’ Red Caboose sits just mere meters from Whale’s Tale Waterpark. Randy, a true craftsman, completed 99% of the renovations. The Lil’ Red Caboose sleeps four people comfortably. The bedroom has a queen bed and the living has a pull-out single bed. Small adults and children will love the single bed in the cupola! There’s a small kitchen and full bathroom complete with a chandelier. The Lil’ Red Caboose is perfect for train enthusiasts and little Thomas the Train fans. Randy and O.J. also have three small cottages and two big suites in the main house available year-round. All accommodations can be booked through Airbnb. Popular in Europe, hostels haven’t always had the best reputation. Put those misconceptions aside and book a stay at the Notch Hostel. 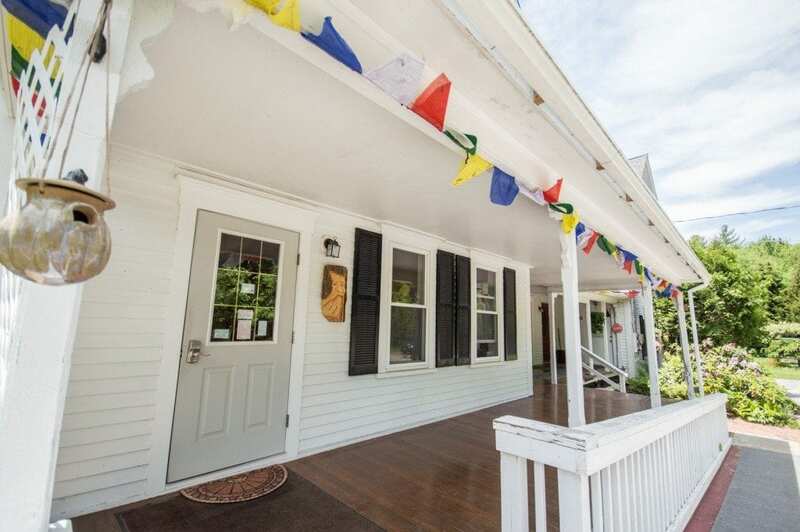 Located along the Appalachian Trail in NorthWoodstock, the 30-guest Notch Hostel is popular with hikers and skiers who come year-round to explore the beauty of the Western White Mountains. 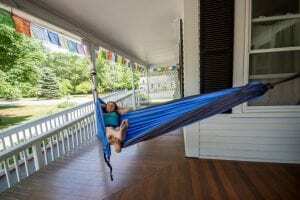 Built in an 1890 farmhouse, the Notch Hostel is full of traditional New England charm. There are four shared rooms and two private rooms along with guest kitchens and a living room with a stove and library. Enjoy the mountains views from the large deck or the fire pit. During the winter months, heat up after a day of skiing in the sauna. There’s a shuttle that will help you get where you’re going and as an added bonus, several rooms are dog-friendly! Whether you’re hiking, climbing, or skiing, save a few dollars and book a bunk at the Notch Hostel. Open seasonally from May 1 through October 20, the Lincoln/Woodstock KOA is one of the best campgrounds in the Western White Mountains. Skip the tent and RV and book the Conestoga Wagon. 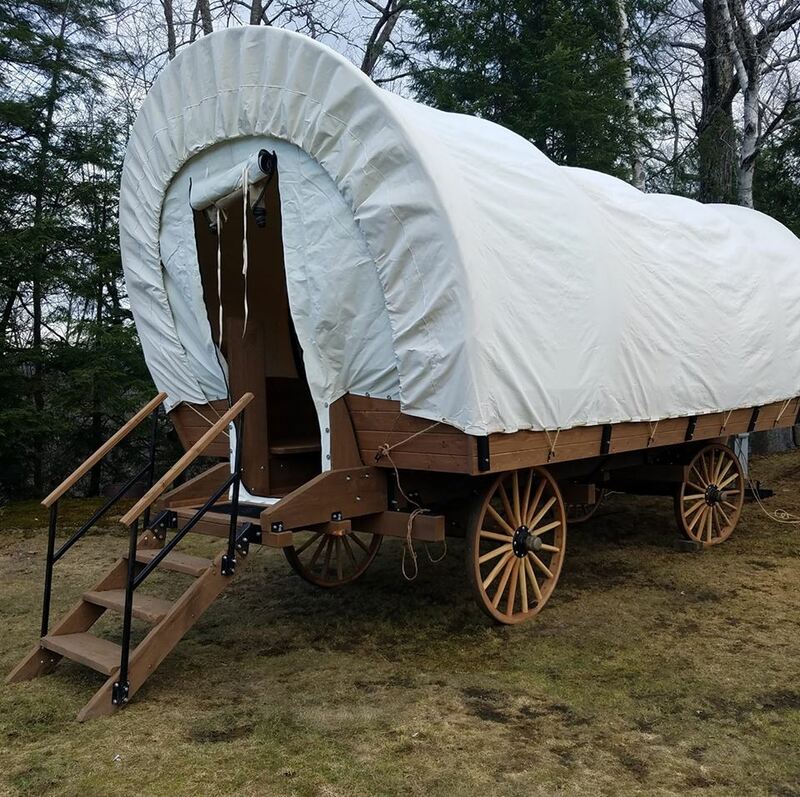 The covered wagon from yesteryears can sleep up to four people with its king bed and cozy bunks. Complete with a fridge, Keurig, and fire ring, you don’t need much other than a pair of cowboy boots in this Wild West adventure. 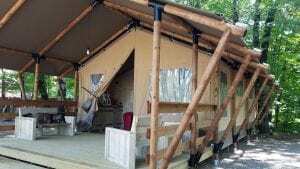 The Lincoln/Woodstock KOA is also home to a safari-themed glamping tent that sleeps up to four people comfortable on a queen bed and two bunks. There’s a full bathroom, TV, fridge,microwave, and charcoal grill. While you won’t spot any lions or tigers at the KOA, you may get lucky and spot other native critters. Just a few miles off Exit 31 on I-93, the Lincoln/Woodstock KOA is easy to get to on your next outdoor adventure. The campground is pet-friendly, has a fishing pond, swimming pool, and lots of nearby hiking and biking trails to keep you active from sunrise to sunset. Located in North Woodstock, the Maple Haven Campground & Cottages is open seasonally. Now in its second year of ownership with the Caulder family, this quaint campground is family-friendly. The campground is within walking distance to downtown North Woodstock and offers both tent and campers sites and seven cottages. Each white clapboard cottage sleeps between two and eight people depending on the number of bedrooms. Most all have a full kitchen and television for the rainy days when you want to relax with a good book. Of course, every cottage comes with a fire pit for all your s’more needs. Like the idea of camping but don’t have all the gear? Effortless Adventure provides camping gear rental package for everything you would need for a fun camping getaway. From coolers to sleeping bags and headlamps to a camp stove, they make packing for camping effortless! Lace up your hiking boots and head out on an unforgettable escape. The Appalachian Mountain Club (AMC) huts have been providing refuge for hikers young and old for over 125 years. During the summer months, you can hike the length of the White Mountains and stay in luxury. Well, as luxurious as a camping hut can be. With in-season, home-cooked dinner and breakfast and running water, what more could you need? With incredible views of Franconia Ridge, Lonesome Lake Hut is just 1.6 miles from the trailhead making it the perfect family-friendly hut. Open year-round, the hut only offers delicious home-cooked meals during the summer and fall months. Overlooking the Pemigewasset Wilderness and Mount Lafayette, the Greenleaf Hut offers some of the best views of the White Mountain region. The hike to the hut is a little more challenging but is so worth the hike. Further down the trail, you’ll find Galehead Hut, which is the most remote AMC hut. From the front porch, you’ll see the natural beauty of the surrounding Pemigewasset Wilderness while munching on your hearty dinner to refuel you for tomorrow’s hike. 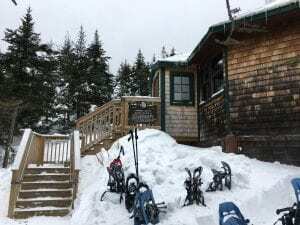 No matter if you choose a simple weekend getaway to the Lonesome Lake Hut or a multi-day trek from hut to hut, you’ll enjoy the friendliness of the AMC hut caretakers and the camaraderie of your fellow hikers. Skip the traditional hotels and condo rentals in favor of one of the western White Mountain’s non-traditional unique lodging experiences on your next visit to the region.